Just in time for the ICC Cricket World Cup 2011, which kicks off in just a few days, ESPNcricinfo has released an app so that cricket lovers can catch up with all the fun from their Android device. The app has a very good and intuitive interface. Their live match coverage which includes ball-by-ball commentary, analysis etc. 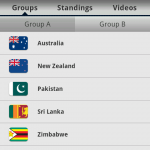 - for which ESPNcricinfo is very famous - will also be available in their Android app. Another feature I like in the app is the leanback mode. When the app is set in the leanback mode, it will auto update with the latest scores. Other features from the ESPNcricinfo website which people love like the articles by cricket experts, match analysis, photographs, video etc. are also available in the app. The app also allows for personalization according to the user's favorite team. After choosing their favorite team, the app will show news, results etc. which related to that team. All in all, this is a very good app which works without any problem on my Android phone. 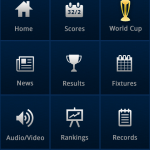 It is definitely a must have app for cricket lovers. The app is available for free from the Android Market and it will run on any device running Android 1.6 and above. Note: If you do not own an Android phone, you may want to read our article on how to get cricket scores by SMS for FREE.